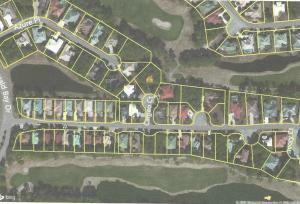 Build your own dream home on this gorgeous Gulf Course lot on hole #4 & #5's tee box in Emerald Bay. Emerald Bay is a gated community with a community pool, tennis courts, golf and is located conveniently to restaurants, shopping and our beautiful beaches. Lot is in flood zone X. Dimensions to be verified by buyer.